Even 15-20 years ago, the library was the main place of gaining knowledge in our country. Each reading room was full of people and everyone read something. With the advent of the Internet the number of libraries visitors decreased. Most of them began to use personal computers. With the advent of laptops and other portable digital devices it became possible to obtain information not only from stationary monitor, but in fact at any convenient location. Electronic book (eBook) is one of such device. You can read it on your way to work or elsewhere. Today we will talk about what is an eBook and how to choose and buy a good eBook. 3. Processor features and RAM. 6. Ebook software and supported formats. An E-Book (e-reader, eBook, pocketbook) is a digital tablet type device for storing and displaying mainly textual information. E-book story can be begun from the work of American inventor Michael Hart. The first e-book as a separate unit appeared in 1996 as a result of DEC company developments. Currently the market is filled with variety of eBooks models. Today there are several types of devices that have function of e-books as additional functionality, but such items have a higher price. In the other side the best producers of electronic books constantly improve and expand capabilities of eBooks. Many people ask: what to choose an ereader or tablet? If to be honestly I think it is better to choose a tablet, because it has a much more functionality. Also I think that in future these devices will merge into one. E-Book screen size can be in the range of 5 to 10 inches (12.7 – 25.4 cm). Overall e-book fosize depends on the size of its display, so you need to choose how and where you will use this book. If you will read at home on the couch, the large display will help to better perceive the information, and if you will read in transport and elsewhere, the great book can be uncomfortable. The average book with 6-8 inches display diameter may be the best option. E-reader display can be manufactured using two different technologies that affect the types of eBooks. The first of these involves the use of E-Ink, second – liquid crystal elements. The electronic ink technology (E-Ink) based on the fact that the entire screen is divided into separate micro cells containing pigments with different charges. In constructing the image some pigments rise to the top, and the other opposite – fall to the bottom, at resulting desired text or images formed on a screen. The main advantage of E-Ink is that such screens have no lights flashing, leaving the reader tired eyes much less. Electronic books using this technology consume very little power and can run for a long time off-line. E-Ink has also some disadvantages. First, these screens are not very resistant to external influences. Secondly, they have a fairly large response time, which does not allow them to show video or animation. The majority of E-Ink screens may display only shades of gray color. Color E-Ink is quite costly and maintain a small number of different colors (up to 4096), which may not be sufficient to view high-quality graphics. Liquid crystal e-book displays based on the same principle as the laptop screens. Such screens can show not only texts but also various images and videos. It is clearly that multimedia capabilities of LCD eBook are higher than its E-Ink colleagues. On the other hand the eyes are tired from LCD much faster and battery can withstand no more than 6-8 hours of active using. By understanding the difference between these two major technologies you can generally understand how the e-book works. I can recommend the following when choosing: if you usually use device for reading of long texts – choose E-Ink, if you want to use multimedia capabilities except the text – buy devices with LCD displays. A modern portable eBook reader as a PC, using processor and memory, which although not as productive and its characteristics can be compared for example with media players. A frequency is the main characteristic for processors. It can be from 33 to 800 MHz RAM in top ereaders. A volume is such feature for the memory (RAM) and it can be from 32 to 512 MB. It is clear that the greater frequency and RAM volume allow the faster work. However, these figures play a significant role in LCD books mainly, because multimedia capabilities are dependent on them. Amount of information you can place which you can storage on your book depends of its internal memory volume. The average internal memory of eBook is between 1 and 4 GB. Also, in most cases, internal memory can be expanded through special slots for digital memory cards, mostly micro-SD. Cards help not only increase the amount of memory, but also to transfer information from other devices. Like other electronic devices, e-Books need a power supply, which is made by rechargeable batteries. The main characteristic of these batteries is its capacity, from which the time of device work depends. 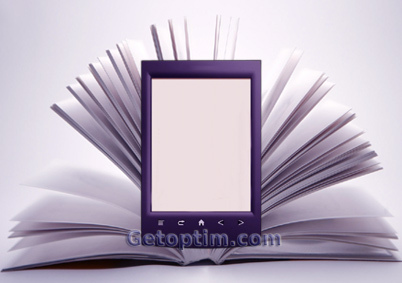 Different models of e-books can have battery capacity from 1000 to 3000 mAh (milliamp hours). The higher capacity is better. The specificity of E-Ink e-book is that they have battery life measured in number of pages that can be viewed to fully discharge. For example, if the e-Book with LCD battery can work about 6-8 hours, the E-Ink books battery can hold 5-8 thousand of page views, such number of pages you can read during several months. The new e-books are increasingly establishing a separate operating system such as Linux or Android. If you already have experience of using one of such system you can choose the e-Book with such OS. Also making the choice of e-books, pay attention to what file formats supported by this e-book. It can be text, picture and video files. The big number of these formats is a good feature, but mandatory this list should include text formats as fb2, txt, djvu, html, doc and pdf. Each of these additional features can extend the functionality of e-books in a particular direction. For example, touch e-book can be controlled by touching its screen, and the presence of Wi-Fi allows you to connect the Internet. We hope that the reading of this information will help you to determine the best ereader (ebook) for you.